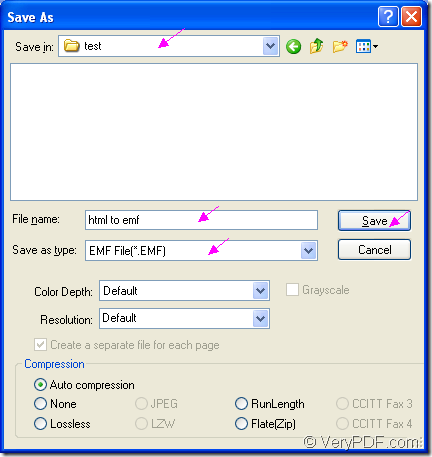 How to convert documents of HTML to EMF? In this article, you will see how to convert document of html to emf with one internal application of Document Converter which is an expert document converter developed by VeryPDF for converting any printable documents to many types of image formats. The internal application is the virtual printer docPrint. As one part of Document Converter, docPrint is a virtual printer, also a document converter. As the virtual printer, docPrint supports to combine several pages in one sheet, it also supports to scale page size, which are all for saving paper and ink. As a document converter, docPrint is capable of converting types of printable documents to image formats. docPrint is easy-to-use and you just need to print the document to docPrint by one press, then you are able to use it. You should download Document Converter at http://www.verypdf.com/artprint/docprint_pro_setup.exe if you want to use docPrint and you should find docPrint in the printer list by opening the “Start” menu and click “Printers and Faxes” after the installation. By seeing the following contents, you will know how to convert html to emf. Firstly, please open the HTML document with some kind of browser like Chrome, FireFox or IE. In the window, please click “File” and “Print” in the dropdown list to open the “Print” dialog box in which you are able to choose “docPrint” as the current printer in “Printer” combo box. To open the “Print” dialog box, you can also use the hot key “Ctrl”+ “P”. Then please click on “Print” button. There is also an other situation that docPrint is the default printer. Please right click the HTML document and click “Print” option in the dropdown list, which can run docPrint directly. Secondly, in the popup docPrint main window, you should try to open “Save As” dialog box which enables you to save the target file and run the conversion from html to emf. Please click the “Save File” button which seems like a floppy disk in the toolbar. Or click “File”—“Save as” to open the “Save As” dialog box. You can also press “Ctrl”+ “S” on the keyboard. 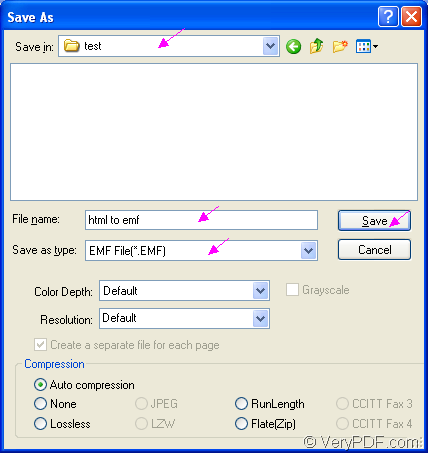 Using one of the above methods, you can open the “Save As” dialog box. Thirdly, in the “Save in” combo box of “Save As” dialog box, you can choose the location for the target file. In “File name” edit box, you are able to input the name for the target file. The “Save as type” combo box supplies many kinds output format and you should choose the right one. Then please click on “Save” button. Please see the “Save As” dialog box in Figure1. These are all the operations about the conversion from html to emf. If you have done all things above, you will successfully get the target file in the specified location. Do you know how to save HTML to EMF in convenient way? How to convert html to emf format? How to convert MS Office Word documents of doc to jbg? This entry was posted in docPrint Pro and tagged html to emf. Bookmark the permalink.